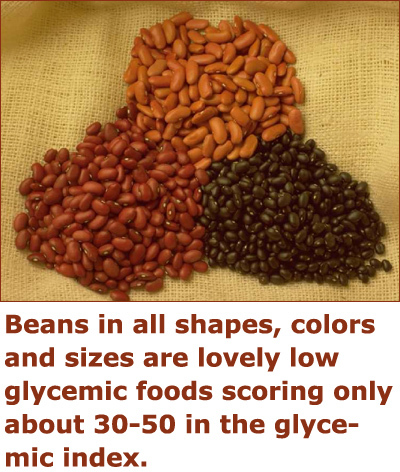 Eating low glycemic foods can have many health advantages, particularly if you are diabetic, suffer from pcos or would like to lose a significant amount of weight. The low glycemic diet, also referred to as the glycemic index diet or the GI diet, has become very popular in recent years. Although it has been around for two decades as a means of controlling blood sugar in diabetics, it really began receiving a lot of attention from the general public when its principles were incorporated into well-known weight loss programs such as The South Beach Diet, the Zone Diet, and Nutrisystem. Very shortly put, low glycemic diets are based on the glycemic index (GI) which is designed to help people make food choices that will avoid insulin spikes and maintain a fairly constant blood glucose (sugar) level. To make navigating this page easier for you, I have made some quick links below, so that you can jump directly to your specific topic of interest. However, I do recommend reading the whole article for a proper, in-depth understanding of everything related to ‘glycemic’ (the foods, the index, the load etc.). What the glycemic index really means and how it relates to your body, blood sugar and insulin production? 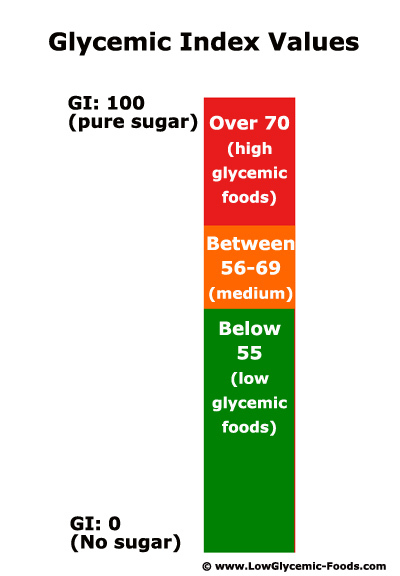 What the goal of eating foods low in the glycemic index is. Simple SHOPPING tips to ease the transition to low glycemic foods. Simple COOKING tips for adding low-GI foods to your diet. The Glycemic Index and the concept of eating low glycemic foods was created in the early 1980s by Dr. David Jenkins, a professor in the Department of Nutritional Science at the University of Toronto, Canada. It was originally designed as a way of helping diabetics manage their blood sugar levels, but in recent years it has also been used by those wishing to lose weight or simply adopt a more healthy lifestyle. Basically, the GI is a measurement of the effect certain carbohydrate-containing foods have on your blood sugar. So, to understand the glycemic index, and any diet that uses its principles, you must first understand the relationship between the food you eat and blood glucose levels. Everything you eat is broken down and converted into glucose which is used to help all your organs and biological systems function properly. Ideally, your body would like to maintain a fairly constant blood glucose level for optimal performance, and it uses a chemical called insulin to try to achieve this balance. 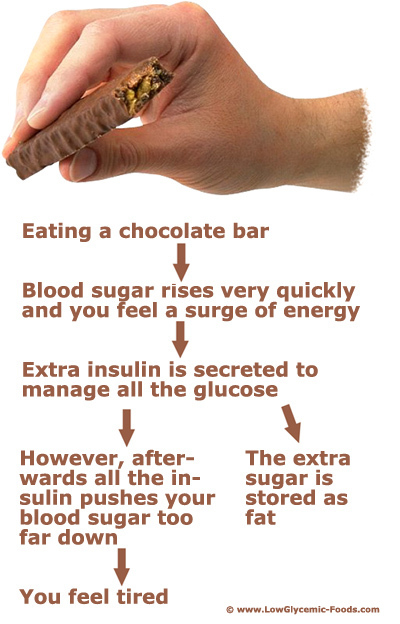 If your blood sugar rises too high, your pancreas will secrete more insulin to bring it back down to a normal level. This is done by converting the extra glucose to fat and storing it in the body – not what you want to happen if you are trying to lose weight! What you eat can also affect how fast your blood sugar level rises. If it increases very quickly, your pancreas will receive a message that there is way too much glucose in the body and will often overcompensate by making excess insulin, which may push your sugar down to a level that is too low. When this happens, you may feel tired, sluggish, or hungry. Feeling hungry is the body’s normal way of telling you that it needs more energy, but sometimes you can experience “false hunger” which can happen when your body tries to pull down high glucose levels. When you eat a chocolate bar or drink a sugar laden coffee, you will initially feel more energetic because your blood sugar is rising. However, in an attempt to regulate the sudden influx of glucose, your body will secrete extra insulin which stores the excess sugar as fat. This will cause a drop in your mood and make you feel tired or hungry again. Of course, you aren’t really hungry, but your body thinks you are because your glucose levels have now dropped quickly, so it is sending you a signal that it needs more energy. Unfortunately, when these sudden fluctuations happen, you are probably more likely to grab another quick energy snack, which will start the process all over again. So, the goal of the glycemic index is to help you identify low glycemic foods that will allow you to regulate your own blood sugar while avoiding all the extreme or sudden fluctuations. It was created by measuring the changes in blood sugar that occurred after eating carbohydrate-containing foods and then ranking them based on these effects. Since pure glucose raises blood sugar more quickly than anything else, it was given the number of 100. This is an arbitrary number and was simply used as a reference with which to compare other foods. The GI value was then determined by looking at how fast – or slow – the body would break down certain foods and convert them into glucose. Foods that are digested quickly and cause a rapid rise in blood sugar are called high glycemic foods and are given a high number on the GI scale (usually over 70). Foods that take longer to digest will also cause blood sugar to rise at a much slower rate and help maintain a steady glucose level, so they are referred to as low glycemic foods and given a lower number (usually below 55). 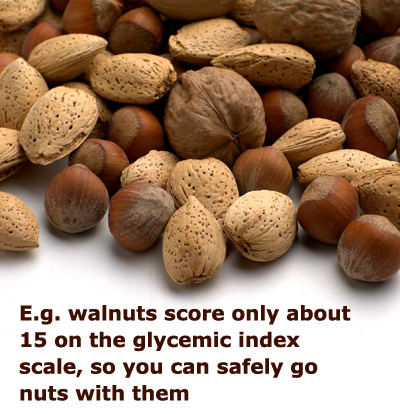 Any food receiving a ranking between 56 and 69 are considered to be medium glycemic foods. 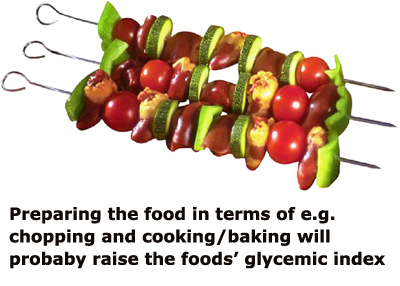 So, the quicker the glycemic response, the higher the number that particular food receives. As a quick example, high glycemic foods would include such things as refined sugars, fruit juices, potatoes, refined grains, and baked goods. Whole grains, beans or legumes, dairy products, and vegetables are all examples of low glycemic foods. To date, the number of foods that have been tested to determine their GI is limited, and the glycemic load (GL) – see further down this page, for an explanation of the glycemic load vs. glycemic index)) for these foods is not always calculated on reference charts. You can usually figure out the GL on your own (once, again, explanation can be seen further down) but you will need to know the GI, the total carbohydrates present in the food, as well as the fiber content. When referring to Glycemic Index and/or Glycemic Load charts, keep in mind that numbers can vary depending on the source, so it may take you a little bit of time to learn how each food reacts in your own body. The chart below, though not comprehensive, will give you an idea of the GI and GL for many common foods. Weight Loss: As mentioned, many popular diets incorporate the principles of the GI diet. The theory is that low glycemic foods cause a slower rise in blood glucose levels because they take longer to digest. Therefore, they stay in your stomach longer, so you feel full and will be less likely to snack or binge eat. Remember, eating high-GI foods causes a spike in insulin which then causes the extra sugar to be stored as fat (not good for weigh loss), and results in a sudden drop in insulin, making you feel energy deprived and craving a quick energy (but calorie packed) snack. Prevent and Manage Type 2 Diabetes: Type 2 diabetes is a condition that results from lack of insulin. 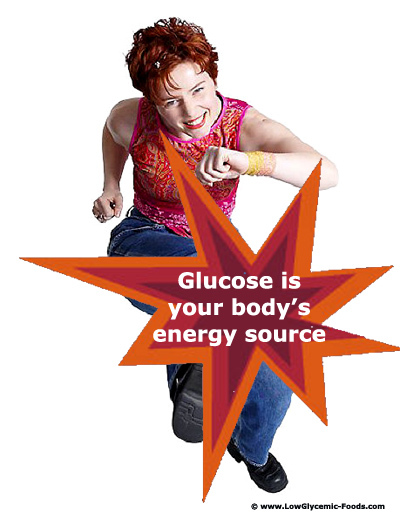 Your body gets energy by converting the food that you eat into glucose, but your cells need insulin in order to use this glucose. If you have type 2 diabetes, your pancreas either does not make enough insulin or your body does not respond properly to the insulin that is being made. So, instead of being used to fuel your cells and organs, the glucose will build up in your bloodstream causing high sugar levels. Many doctors believe that a high glycemic diet may increase your risk of developing type 2 diabetes because you are putting a heavy demand on your pancreas by asking it to constantly work to bring down excessive glucose levels in your body. This extra workload may result in the pancreas eventually “tiring out” or malfunctioning, leading to diseases such as diabetes. If you already have diabetes, there is a lot of evidence that following a low glycemic diet may help you manage, or even improve, your condition. Since low glycemic foods are digested more slowly, they will not cause your blood sugar to spike so your pancreas can easily keep up with the amount of insulin needed. Choosing low glycemic foods also helps to keep blood sugar at a more constant level, which is vital for those suffering with diabetes. Many doctors believe that a low-GI diet can also make your body more insulin-sensitive which could reverse – or at least improve – your condition. Reduce Risk of Heart Disease: Research has shown that there may be some connection between raised insulin levels and heart disease. Findings suggest that a high-GI diet causes spikes in both glucose and insulin, which may increase LDL cholesterol levels in the body. Evidence also shows that eating a diet rich in low-GI foods will help keep blood sugar and insulin secretion under control, which may reduce LDL (bad) cholesterol while also raising HDL (good) cholesterol. Some people find that switching to a low glycemic diet can be a little complicated since there are so many foods that have not been tested. Also, there are a number of factors that can affect the GI level such as cooking and preparation, fruit ripeness, and certain combinations of foods. In fact, this has been one of the criticisms facing the diet over the years. However, like any other diet (vegetarian, vegan, Paleo), once you have switched your kitchen over to your new way of eating, things will become much easier. The fundamental principle of the low glycemic diet is to eat everything as whole and unrefined as possible. 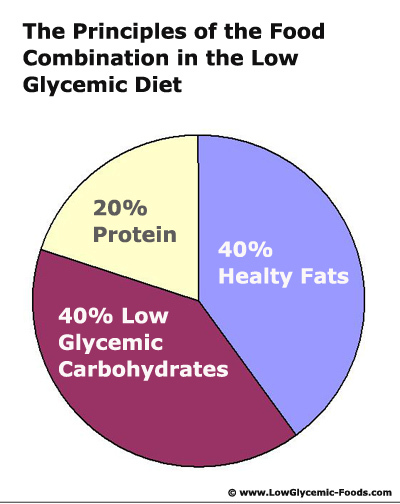 Plus most proponents follow a ratio of 40% carbohydrates, 40% healthy fats, and 20% protein. Although it doesn’t apply for all foods, the general rule is that foods high in fiber, healthy fat, and protein are likely to be low on the glycemic index; whereas foods that lack these essentials will be ranked higher on the scale. Since a large portion of your diet consists of grain products, this is a good place to begin. Switch your instant oatmeal for steel-cut oats or oat bran, buy whole grain breads and flours, trade your white pasta for whole grain varieties, and try adding something new, such as quinoa or barley to soups and stews. Find low glycemic recipes and shop for those ingredients. This is a great way to learn which products are considered to have a low-GI and will also take the stress off you when you are first making the change to a new diet. Most packaging will not tell you a product’s glycemic rating, but you can make an educated guess by reading the list of ingredients. If sugar or glucose is the first ingredient on the list, then there is a good chance that it will not be low glycemic foods. Even the title “whole grain” can be somewhat deceiving since the GI level will depend on which grains are used. For example, spelt can rank very low, whereas millet usually rates medium or even high. Also, olive oil is considered to be a healthy fat, but hydrogenated “trans” fat is dangerous and can also raise cholesterol levels. Many fruits and vegetables have already been tested for GI ranking so you should have a substantial list to refer to when shopping. And, adding more fresh produce into your diet is a major recommendation of the low-GI diet. Not only will whole grains provide your body with many nutrients, they are also filled with fiber and protein so they are digested much slower and will not spike your glucose level or put undue demand on your pancreas. Today, everything from bread to pastas and breakfast cereals are available in whole grain, so making the switch will only be a matter of taste rather than convenience. And the more unrefined, the better! Large flaked rolled oats, oat bran, barley, muesli, and whole wheat are some of the more common options; but, why not try something new. When it comes to grains, everything old is new again. There are several ancient grains that have been shelved for many years in favor of white flour and processed wheat, but these little powerhouses are making a comeback. Spelt: This ancient variety of wheat is packed with more nutrients than traditional wheat and is only 54 on the glycemic scale. Substitute it for your regular flour in muffins, breads, and even cakes. Quinoa: These small round kernels offer a complete protein and can be substituted for rice, used in soups and salads, or added to muffins and breads. Unlike spelt, quinoa contains no gluten or wheat so it can be used by people with allergies to these substances. 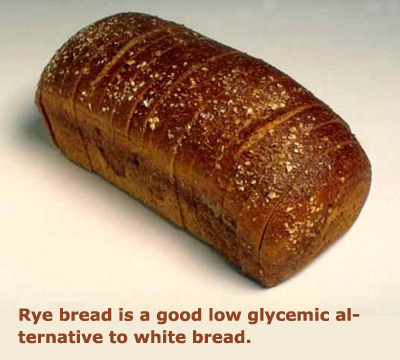 Rye: Besides making delicious bread, rye flakes can be added to oatmeal, trail mix, or yogurt. Buckwheat: Since buckwheat is not really a grain (but a seed from the rhubarb family) it can be used by people who have allergies to wheat or gluten. Buckwheat pancakes are delicious, as are groats, and this is a great way to add low glycemic variety to your diet. Wild Rice: Like Buckwheat, wild rice is not really a grain, but the seed of a special type of water grass. Packed with protein and fiber, these nutty morsels have a GI ranking of 45 and can be eaten alone or mixed with brown or basmati rice. Pasta: Pasta is forbidden on many diets, but the low-GI diet actually recommends it as long as it is whole grain and mixed with vegetables and some type of low fat protein such as chicken or fish. Flaxseeds: Flaxseeds are very nutritious and can be added to muffins, bagels, and breads. Some people even add ground flax to their morning oatmeal or stir a spoonful into their soup. Flax oil is also delicious over potatoes or steamed vegetables. Beans and legumes can be a little high in carbohydrates, but they are also high in fiber, low in fat, and contain as much if not more protein than many types of meat. You can make chili, split pea soup, or lentils with rice. Add chick peas to your lettuce salad, put pinto or baked beans into tacos, or toss a bean medley into stir fries for added flavor. The low glycemic diet suggests that fruits and vegetables should comprise about half of each meal. Most fruits and veggies are low in calories, contain a lot of energy and nutrition, and are low or medium on the GI scale. They are an easy way to fill up without gaining weight or spiking your blood sugar. Add a mix of your favorite vegetables to pastas or rice dishes, add fruit to your cereal, greens to your omelets, or make a veggie tray with hummus for a light lunch. There are so many interesting fruits and veggies out there that you have probably never tried, so the low-GI diet offers the perfect opportunity to expand your repertoire. Even keeping a container of fresh, cut vegetables or fruit in the fridge will make it easy to grab a healthy snack when you feel like nibbling. 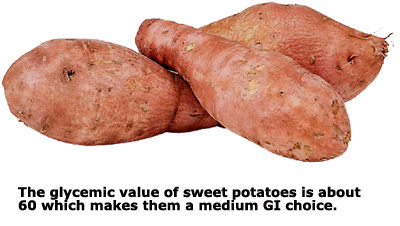 Sweet potatoes (which are actually not real potatoes but roots) rank between 50 and 60 on the glycemic index, whereas, white potatoes can be as high as 110. Nuts and seeds are a good source of protein and healthy fats and will also add some substance to your meals. Many people avoid these foods because they think that the high fat content will make them gain weight, but their low glycemic index values mean they won’t spike your glucose so most of their energy will be used by the body. Of course, you need to eat them in moderation, but with almonds and walnuts having a GI of 15 and sunflower seeds having a GI of 35, these foods make a tasty treat and will keep hunger at bay. The glycemic index on its own can be very helpful, but there were some people who felt that it had one serious limitation. While it measured how quickly the sugar of a particular food entered your bloodstream and spiked your glucose level, it didn’t take into account how much carbohydrate (sugar) was actually in that food. For example, depending on how they are prepared (cooked or eaten raw), carrots have a GI ranking of 47-63 because their sugar is absorbed very quickly. For this reason, many people think that they need to avoid eating this vegetable because it will make them gain weight. However, it is unlikely that you have ever heard anyone claim that they are overweight because they ate too many carrots. The truth is that, although the carbohydrates in carrots will enter the bloodstream quickly, there is very little sugar in carrots so the affect will be minimal. Those focused on healthy eating rather than simply blood sugar levels began to dispute some aspects of the glycemic index. There had to be something not quite right with a system that ranked chocolate and potato chips a better food choice than the vitamin packed carrots and potatoes. If you were using the GI as your guide to food choices, you could skip the veggies and go straight to dessert. The flaw is that the GI measured how quickly foods affected your blood sugar but it couldn’t tell you how much carbohydrate (sugar) you were actually getting. Like many other theories and ideas, it takes some time to work out the “kinks”. That doesn’t mean the concept is not good, but simply that it needed some modifications. So, in 1991, Dr. Walter Willet and his associates at Harvard School of Public Health came up with idea of Glycemic Load. Glycemic load not only measures how fast the sugar from particular foods are absorbed into the body, but it also takes into account how much carbohydrate (sugar) that food actually contains. The glycemic response is not only dependent on what food you eat, but also on how many of the calories are derived from carbohydrate – or how many carbohydrates (sugars) are in each serving of a certain food. Fiber actually cancels out carbohydrates gram for gram, so the dietary fiber content will change how the carbohydrates in that particular food affect the body. For example, a chocolate bar contains around 30 carbohydrates but 0 grams of fiber. On the other hand, one cup of fresh cooked carrots has 11 carbohydrates but also 5 grams of fiber, making the net carbohydrate (sugar) content about 6. So, which one do you think is less likely to cause a huge insulin spike and, subsequently, weight gain? So, the truth about the forbidden carrot is that its sugar is released very quickly, which is why it has a high GI, but since it doesn’t actually contain a lot of sugar to begin with, it is given a GL of about 3. Therefore, your pancreas is not in danger of secreting excess insulin to control the affect that a carrot will have on your blood sugar levels. And, most people would not argue with the fact that eating carrots and high GI fruits that contain many essential vitamins and minerals is much more beneficial to your body that consuming potato chips and candy. and limit your take of carbohydrates. But, remember, just because a food is high in carbohydrates does not mean it will have an extreme effect on your blood sugar. You must also look at the fiber content to get an accurate picture. And also keep in mind that some high glycemic foods contain very important nutritional elements, so they should not be eliminated completely from your diet. A quick internet search will show that various glycemic index charts will give different rankings for particular foods. Some will even show a plus or minus value (ie. 24 +/- 12 meaning that the food could have a GI value of anywhere between 12 and 36). For those watching their blood glucose levels, this can be a significant difference. In determining a GI ranking, several tests will be performed by the researchers and the average results will be used on the final chart. So, sometimes the result was higher than the stated amount and sometimes it was lower. Studies have also shown that some fruit will increase in GI ranking as it ripens, so you have to make sure that you eat your banana at exactly the right time in the ripening process or your sugar calculations will be inaccurate. Since it is often impossible to get an exact measurement, you will find a lot of conflicting data that can make following a low glycemic diet somewhat confusing. GI can be affected by how a food is cooked or processed. Simply grinding or chopping a food can increase its GI value because it makes it easier to digest and can be processed by the body faster. Also, cooking can change the structure of the food’s components (particularly starch), giving it a higher GI since it is more readily absorbed by the body. This is why al dente pasta has a lower GI than noodles that have been cooked for a longer period of time. Unless you know the GI of every food at every level of preparation, it is difficult to get an exact measurement of the influence it will have on blood sugar. The GI value of a particular food can vary depending on whether it is eaten alone or with other foods. For example, you may know that a banana has a GI of about 60, but the effect that its carbohydrates will have on your blood sugar will change if you eat it with high protein peanut butter or add it to a bowl of high fiber cereal. You body doesn’t distinguish individual foods, but processes what it is given at a particular point in time. So, if you mix high glycemic foods with low glycemic foods you can actually create a medium GI meal. And, a half of banana eaten with a large bowl of All-Bran will almost negate the carbohydrates in the fruit, while still allowing you to get all the nutritional benefits. Add to this the fact that the GI of the banana will vary depending on its level of ripeness and you can see that it could take some practice to master the art of food combinations on a low glycemic diet. The human body is not a cloned machine – responses to various foods can vary from person to person. Since everyone’s digestive system and insulin production is different, their glycemic response will also be different. Furthermore, some studies have shown that glycemic responses can change depending on the time of day or even the time of year, and may also be affected by such things as medications, supplements, and sleep patterns. Some people think that the low glycemic diet is too difficult to follow because there are so many variables. Things such as ripeness, preparation methods, food combinations, and time of day can make the diet very complicated and stressful. Some unhealthy foods are very low on the GI scale while some very nutritious options have a high GI, making it necessary to calculate glycemic load for every food you eat. Yes, there are charts available, but these are not always consistent and only a limited number of foods have actually been tested. And, since it is not required to list the GI on product labels, it can be difficult to calculate, especially in the beginning. Proponents of the diet claim that it takes some time to make the adjustment, but the same can be said for any major change that is made in one’s life. Once you become familiar with the diet, it will be a comfortable lifestyle with many benefits. Since it was first introduced, the low glycemic diet has been very helpful in the treatment and management of diabetes. More recently, it has been used both as a weight loss tool and a means to achieve healthier eating habits. While many people have found the GI diet to be very effective at regulating blood glucose levels and aiding in weight loss, it is important to keep in mind that the program must be used correctly or health issues could arise. Anyone wanting to implement this diet should gain an understanding of how the body uses carbohydrates for energy and learn how the preparation and combination of foods can affect blood glucose levels. Furthermore, glycemic load must be taken into consideration. By using only the GI as a guide, it is possible to become deficient in necessary nutrients since many essential fruits and vegetables are ranked very high on the GI scale and may be avoided for fear that they will cause extreme sugar spikes or weight gain. This is not the case, and maintaining good health while on the GI diet means finding a way to combine High-GI foods with Low-GI foods so you can create a healthy balance. Many people have enjoyed relief from illness and disease by following the Low GI diet, and it is proposed that those who experienced problems were not using the program correctly or were failing to consider the GL as well as the GI of particular foods. As with any diet, balance is the key!